Share market HIGHLIGHTS: Sensex and Nifty ended in the negative territory on Wednesday, however trimming some of the day's losses. Market sentiment turned cautious ahead of the September month derivatives expiry on Thursday and outcome of the US Federal Reserve meet later in the evening. Stock market highlights: Minutes into trading, Sensex and Nifty quickly trimmed gains as investors booked profits. "Stock markets in India started the day on a positive note but soon succumbed to selling pressure to spend the day in the negative zone. Investors adopted a note of caution as they awaited cues from a US Federal Reserve meeting that ends later in the global day. Additionally, concerns about continuing trade tensions lingered, capping intermittent flickers of upside momentum. Both the benchmark Sensex and the Nifty finally ended the day with losses of over ~0.20%. Sectoral performance on the National Stock Exchange (NSE) was mixed. While the IT, PSU banking, FMCG and auto indices lost ~1% in trade today, the metals and realty indices witnessed gains of over 1.5%." 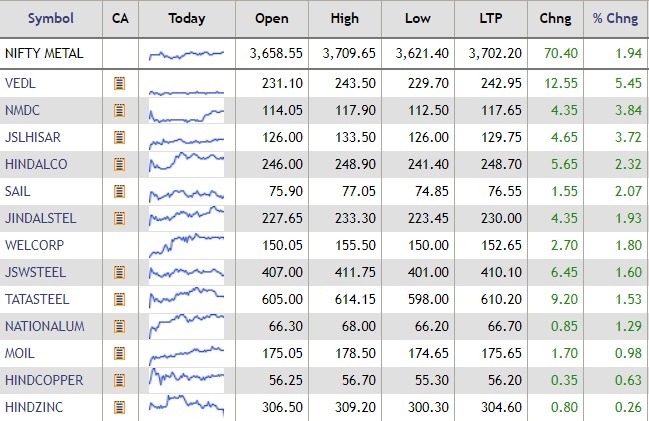 Share market update: Indiabulls Housing Finance was the top gainer on the Nifty index today, while Tata Motors was the top drag. 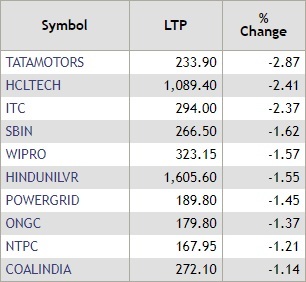 Check out the other gainers and losers on Wednesday. The Sensex recovered from its day's low to close 109.79 points or 0.30% lower at 36,542.27 points. The NSE Nifty ended at 11,053.80 points, down 13.65 points or 0.12%. The Nifty 50 index of the NSE traded 2.05 points or 0.02% lower at 11,065.40 points in late-afternoon trade deals. Out of the 50 stocks trading, 23 declined and 27 advanced. Indiabulls Housing Finance was the top Nifty gainer, followed by UPL, Vedanta, Titan and Hindustan Petroleum. Tata Motors was the top drag, down 3.09%. The BSE Sensex trimmed some losses to trade at 36,571.05 points, down 81.01 points or 0.22% lower, during late afternoon trade deals. 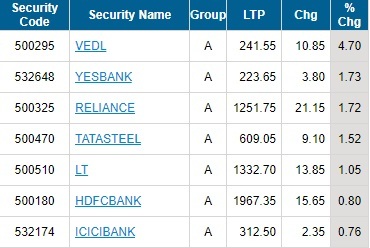 Healthy buying in Reliance Industries, HDFC Bank, Yes Bank, Vedanta, Tata Steel and LT among other index heavyweights helped the benchmark to trim some losses. 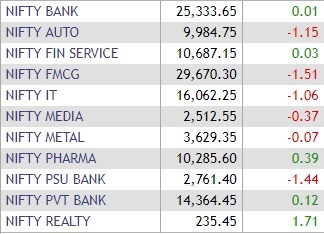 The Sensex slipped over 250 points during afternoon trade session as most sectoral indices slipped into the red. Fitch Ratings on Wednesday placed Bank of Baroda's viability rating (VR) on rating watch negative (RWN), post the government's proposal to merge the lender with Vijaya Bank and Dena Bank, PTI reported. The bank's VR currently stands at 'bb'. The action comes a day after another international rating agency Moody's affirmed ratings of Bank of Baroda, and kept outlook on all the ratings as stable. Global market update: Shares in Hong Kong closed higher on Wednesday, with trade war fears taking a back seat to rising hopes that the expanded index inclusion of A-shares could lift the broader market, and as high oil prices boosted energy firms, said a Reuters report. The Hang Seng index rose 1.2%, to 27,816.87, while the China Enterprises Index gained 1.5%, to 10,985.60 points. Punjab National Bank on Wednesday said the board of the company will consider an infusion of Rs 5,431 crore by the government. Following the development, shares of PNB jumped 3.35% to a high of Rs 69.30 per share on the BSE. In a regulatory filing to the BSE, the bank informed that the meeting of the Board of Directors of the company to consider and approve capital infusion by the government and fixing date of EGM is scheduled on 27 September. The government Wednesday approved a Rs 4,500 crore package for the sugar industry that includes over two-fold jump in production assistance to cane growers and transport subsidy to mills for export up to 5 million tonnes in the marketing year 2018-19, PTI reported quoting sources. The Cabinet Committee on Economic Affairs (CCEA) approved the food ministry's proposal that seeks to address the surplus domestic stock of sugar and help mills in clearing huge cane arrears of around Rs 13,000 crore. 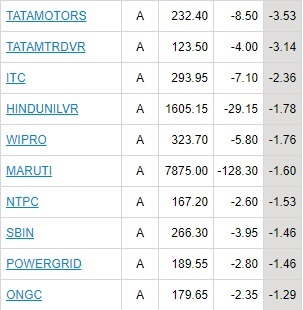 NBFC stocks witness sharp sell-off in the last few days due to concerns regarding rollover of short-term credit and availability of funds, says a Citi Research report. The report said that while borrowing costs may rise going forward as investors become more cautious, the liquidity situation for NBFCs under its coverage manageable. Citi does not see near-term liquidity risks for most companies under coverage based on whether inflows/asset maturities over the next year exceed outflows/liability maturities. Higher market yields may raise borrowing costs and put NBFCs' NIM under pressure, especially those that are more dependent on market borrowing, Citi analysts add. HDFC Ltd and L&T Finance Holdings Ltd are the top picks of Citi. HDFC has strong funding franchise with access to deposits and other options, while LTFH has been delivering well on its shift towards retail lending, added the Citi report. The Union Cabinet is likely to discuss the draft of the new telecom policy, known as National Digital Communications Policy (NDCP) 2018, today. 'The draft NDCP is expected to be placed before the Cabinet for approval tomorrow,' PTI reported on Tuesday quoting official sources. Following the development, Vodafone Idea shares rose nearly 2% in Wednesday's trade. On the other hand, Bharti Airtel shares were trading flat. Global market update: Australian shares rose fractionally on Wednesday as gains in materials and energy stocks on higher oil and commodity prices offset losses for banks as release of an inquiry's interim report on the sector nears, said a Reuters report. The S&P/ASX 200 index rose 0.1% or 6.4 points to end at 6,192.3. On Tuesday, the benchmark slipped 1 point. 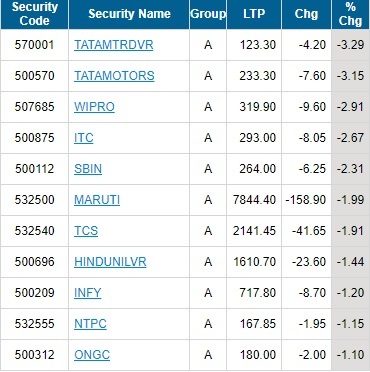 NSE live: Tata Motors led the pack of top laggards on the Nifty 50 index, followed by HCL Tech, ITC, SBI, Wipro and HUL. 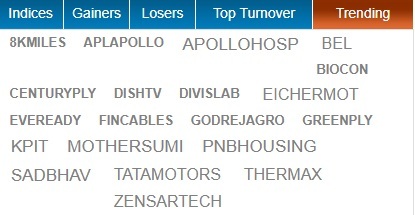 Check out the top 10 losers on the NSE. While the headline indices -- Sensex and Nifty -- slipped into the negative territory, the broader markets bucked the trend. During afternoon trade deals, the S&P BSE midcap index was trading 0.20% higher, while the small-cap was up 0.09%. The Supreme Court on Wednesday declared the Centre's flagship Aadhaar scheme as constitutionally valid but struck down some of its provisions including its linking with bank accounts, mobile phones and school admissions, reported PTI. A five-judge constitution bench headed by Chief Justice Dipak Misra held that while Aadhaar would remain mandatory for filing of IT returns and allotment of Permanent Account Number (PAN), it would not be mandatory to link Aadhaar to bank accounts and telecom service providers cannot seek its linking of Aadhaar for mobile connections. Share Market Live: Tata Motors, Motherson Sumi, BEL, PNB Housing Finance stocks are among the top trending stocks on the BSE today. 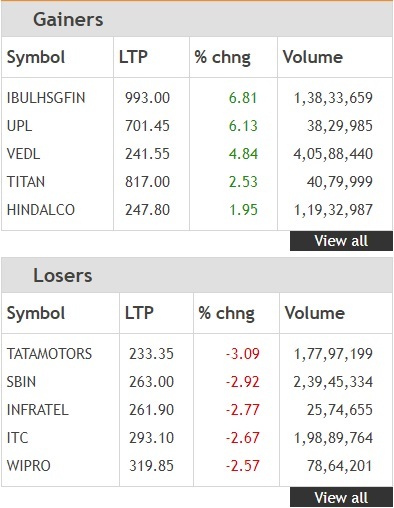 The Sensex slipped over 200 points in the pre-noon trade session today with heavy selling pressure in auto, FMCG, IT, oil and gas, and Teck stocks. 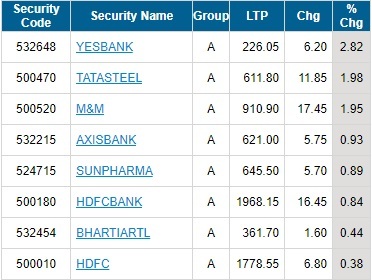 Most PSU banks stocks were trading lower on the Nifty PSU Banks index. Shares of Andhra Bank (-3.27%), SBI (-1.86%), Bank of Baroda (-1.19%), Bank of India (-1.19%), Allahabad Bank (-0.93%), Syndicate Bank (-0.90%), OBC (-0.90%) and Union Bank (-0.29) were trading lower in pre-noon trade deals today. Asian shares pulled ahead on Wednesday, as Chinese markets extended their recovery to hit eight-week highs on receding fears about the trade war as well as hopes China's weighting in the global benchmark will be increased, said a Reuters report. Spreadbetters expected European stocks to open flat to firmer, with Britain's FTSE starting little changed, Germany's DAX adding 0.2% and France's CAC up 0.05%. Other markets were more subdued as U.S. bond yields edged near a seven-year peak ahead of a widely expected rate hike by the Federal Reserve and as international oil prices rose to four-year highs. MSCI's broadest index of Asia-Pacific shares outside Japan gained 0.5%. Shanghai shares rose 1.55%. 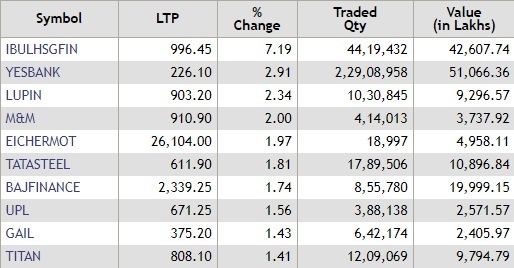 Dewan Housing Finance Corporation (DHFL) shares over 6% on the BSE on Wednesday after LIC said it will not allow debt-ridden IL&FS to collapse and explore options to revive it. Shares of DHFL has been witnessing wild swings since Friday following reports that Infrastructure Leasing and Financial Services Ltd (IL&FS) and its units had defaulted on repayments. DHFL shares had slumped nearly 34% yesterday, however recovering from its day’s low to finally close down 23.49% at Rs 300.70. DHFL shares had surged nearly 25% on Monday after a 60% plunge on Friday. IL&FS Group companies shares gained on Wednesday after state-owned insurer LIC said it will not allow debt-ridden IL&FS to collapse and explore options to revive it. The scrip of IL&FS Engineering and Construction Company gained almost 18% during morning trade session on the BSE. IL&FS Transportation Networks rose 4% and IL&FS Investment Managers surged almost 10%. FMCG stocks were trading lower during morning trade session with shares of ITC losing nearly 2.5% on the NSE. Britannia (-1.85%), Godrej Industries (-1.50%), Tata Global Beverages (-1.21%), HUL (-1.09%), Procter & Gamble (-0.82%) and Dabur (-0.46%) were among the top losers. "I think NBFC sector fears are exaggerated. The sector has robust regulatory framework, is growing well helping financial inclusion-nation’s growth by delivering credit to the underserved! Excessive panic can cause heart attack in a healthy body. Equity sentiment always moves in a pendulum." Minda Industries shares surged by 8.40% to a high of Rs 372 per share after the company approved setting up manufacturing plant for 2-wheeler alloy wheels in Maharashtra. Shares of automotive solutions supplier posted their biggest daily percentage gain since July. Gold prices drifted in a narrow range on Wednesday as investors awaited cues of the U.S. Federal Reserve's two-day meeting, where policymakers are expected to raise interest rates for the third time this year, said a Reuters report. Spot gold was up 0.1% at $1,201.64, as of 0337 GMT, having moved in a $3 range early Wednesday. U.S. gold futures climbed 0.1% to $1,206.0 an ounce. Yes Bank shares climbed 4% on the NSE after the private sector lender's board said it has decided to seek Reserve Bank of India's approval to extend CEO Rana Kapoor's term until April 30, 2019. The shares of Yes Bank surged to an intra-day high of Rs 228.50 per share in early morning deals. Deutsche Bank says given the uncertainties around Yes Bank and its strategies, medium-term growth/fees may be challenging, reported Reuters. Deutsche Bank has cut price target to Rs 310 from Rs 350 while retaining "buy" rating. The rupee recovered by 8 paise to 72.61 against the dollar in early trade Wednesday on mild selling of the US currency by exporters amid easing crude oil prices, said a PTI report. Currency traders said weakness in the dollar against some global currencies overseas and a higher opening of the domestic equity market supported the rupee. The rupee had lost 6 paise to close at 72.69 on Tuesday due to sustained demand for the American currency amid soaring crude prices. Yes Bank: The Yes Bank board has decided to seek at least a three-month extension for Rana Kapoor, managing director and chief executive, from RBI beyond January 31, 2019. DHFL, IL&FS Group stocks: State-owned insurer LIC said it will not allow debt-ridden IL&FS to collapse and explore options to revive it. Bank of Baroda: The board of Bank of Baroda will meet on September 29 to consider the government's proposal to merge Dena Bank and Vijaya Bank with itself, its Managing Director P S Jayakumar said Tuesday. Idea Cellular, Bharti Airtel: The foreign direct investment (FDI) in the telecom sector rose to USD 6.2 billion in the last fiscal, a near five-fold increase from USD 1.3 billion in 2015-16, Union Telecom Minister Manoj Sinha said Tuesday. Videocon: Resolution professional of debt-laden firm Videocon Telecommunications Tuesday invited bids from prospective buyers for its assets as part of corporate insolvency resolution process, said a PTI report. Oil prices were supported on concerns of tight supply on U.S. sanctions on Iran's oil exports, quickly paring early losses following data showing U.S. crude stocks rose unexpectedly last week and renewed call from Trump on OPEC to boost crude output, according to a Reuter's report.